Dan Jurgens upcoming debut on The Fury of Firestorm: The Nuclear Men is not the first time he has worked on a Firestorm monthly comic. Surprised? I thought so. 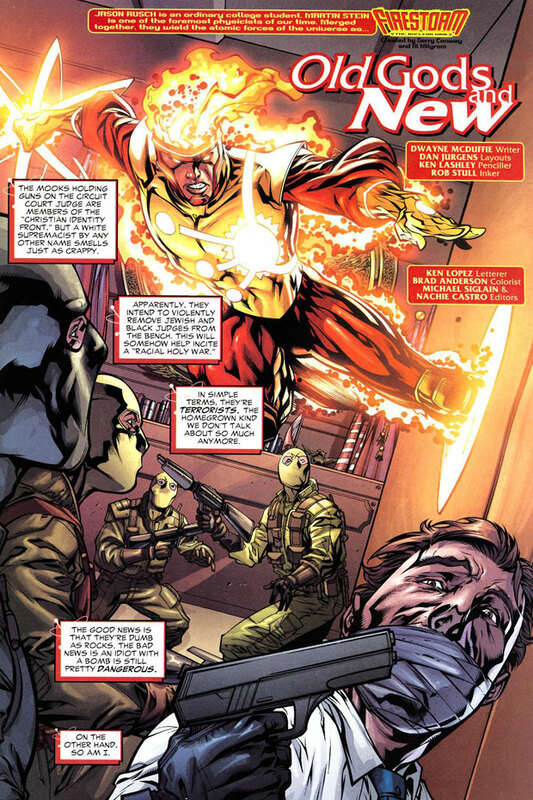 Back in 2007 Dan Jurgens did the layouts for Firestorm The Nuclear Man #33. The issue was written by Dwayne McDuffie, penciled by Ken Lashley, inked by Rob Stull, and colored by Brad Anderson. Dig out your back issues and check out this comic! Jurgens, Lashley, Stull and Anderson deliver some beautiful artwork in this story. If you study the panel design, figure positioning, and perspective, you’ll notice this comic is incredibly well put together. There is no way to know how much is Jurgens and how much is Lashley, but clearly together they make a great team! An added bonus to rereading this issue is remembering that short-lived era when Jason would merge with Professor Stein to create Firestorm. They had a great dynamic together and not enough time to explore it. Plus, in this issue you witness Firestorm holding his own against the New God Orion! That’s not something you get to see everyday! Support Firestorm (and Dan Jurgens)! Fan the flame! Posted in: Dan Jurgens, Firestorm #07: Jason post-Infinite Crisis, Firestorm comic vol. III, Jason Rusch, Professor Martin Stein. Well this is embarrassing, I own page 16 from that issue and hadn’t even noticed that lol.